The scholarship on postcolonial feminism is a growing field of knowledge production and South Asian feminist works have emerged as an important part of this scholarship in the last couple of decades. The rich and diverse social and cultural anthropological studies have contributed to this field by successfully interrogating and often re-defining the relationship amongst feminist politics, ethnographic writing and the ethicality of representation. Debarati Sen’s book is a valuable contribution to postcolonial South Asian feminism for its rigorous research, self-reflexivity and lucid language. Nepali women of Darjeeling cease to be the objects of knowledge in Sen’s observations and become subjectivities in the making—contesting, negotiating and challenging the changing social and political processes around the production and marketing of tea. Sen writes, ‘They [women plantation workers and women farmers] are not just born out of simple kin networks, labor unions, or political parties, but out of decades of contesting local developments, individualized and/or limited women’s empowerment strategies, which collude with male patriarchy and ignore women’s grounded micro-strategies’ (p. 15). 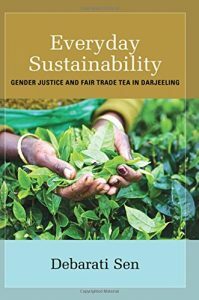 Sen argues that the dominating discourses and practices of Fair Trade in the contemporary tea industry of Darjeeling seem to be a continuation of the older regimes of big plantations and labour unions in terms of the ideas of gender justice. The critique of liberal modernist transnational gender justice regimes informs Sen’s work in different ways as she makes a case for social sustainability beyond measurable outcomes, emphasizing how women in rural Darjeeling ‘demonstrate social innovation and social entrepreneurship, CSR social work buzzwords—with great finesse and sagacity’ (p. 21). The book is divided into eight substantive chapters along with an Introduction and Conclusion. One of the striking features of the book is its continuous unfolding of methodological questions through the principal chapters after Sen familiarizes her readers with the key debates on feminist ethnography in the first chapter ‘Locations: Homework and Fieldwork’. An interesting discussion on researching the ‘backyard’ vis-à-vis the multiple locations occupied by a feminist researcher makes this chapter a kind of curtain raiser for the mobility in transnational feminism, carefully mapped in the following chapters. Sen has also briefly discussed the tension between the positions occupied by feminists as activists and academics, prudently designating her work as academic with an acknowledgement of activists’ contribution in the production of knowledge. The layers of ‘doing’ feminist politics either through activism or academic research begin to shape the course of her arguments from her very first chapter. The range of source materials covered in this research is referred almost conversationally, without making heavy weather about interdisciplinary research, and gets the point across that feminist ethnographies are more about the ability to read diverse and uneven sources through each other rather than cross-checking of ‘data’ for validity. An important aspect of Sen’s book is its firm grounding in the political economy of the tea industry—an acute awareness of the chequered history of tea plantations, government interventions after Independence, the role of workers’ unions, and the crisis of marketing that led to Fair Trade and its discontents. Sen draws from the existing academic literature on the politics of ethnicity in the hills of Darjeeling from the 1980s as well as the international debates on Fair Trade and sustainable development to put her ‘field’ in a dynamic tension with its world-wide market. ‘Everyday Marginality of Nepalis in India’ and ‘The Reincarnation of Tea’ disentangle the different threads of history and politics which formulate the fabric of everyday struggles of women in rural Darjeeling. Sen handles large chunks of historical details and political complexities with succinct description. She is almost telling a story but does not miss a step while teasing out the vulnerabilities of Nepali women plantation workers and farmers. The stigma Nepali women face as ‘forward’ (read promiscuous) to the rest of India, their exploitation within the patriarchal social order of celebrating ‘pahadiness’ (essence of Hill People) of Nepalese, the devaluation of their labour in the development regimes, and their struggle for assertion to navigate the transnational gender justice system propagated by Fair Trade, come alive in ‘Fair Trade and Women Without History’. The chapter is particularly interesting as several characters enter Sen’s narrative—European and North American ‘Fair Trade enthusiasts’ (Sen’s term to describe activist consumers of Fair Trade who are mainly students or NGO volunteers to gain experience), the local administrative staff of the Joint Body—the council with participants from the management and workers, and women workers. With great care and detail, Sen uncovers how the promotion of social justice in the global South has turned Fair Trade into political consumerism and how the manipulation of the enthusiasts’ ‘witnessing’ of the benefits of Fair Trade certified workplaces advances a ‘soft-bio politics’. The unmasking of this manipulation does not hold the enthusiasts responsible for their blinding naiveté but rather exposes how the ethicality of consumerism can be held hostage to mutations of global capital—from centralized plantation economy to diffused small-farm management. The voices of women workers and farmers become embodied existence from the chapter ‘Ghumaori’—an older clandestine economic practice among rural Nepali women. The labour unions, the Leftist women’s organizations, and the ethnicized party politics have gradually lost any purchase among the rural working women because of their inability to address specific problems faced by women at their workplaces. The return to Ghumaori could have been a romantic linkage between the ‘feminine’ and the ‘feminist’ history, but Sen restrains from the gossamer shine of collective memory and focuses on ‘women’s very subjective interpretations of political ideology, work, and hegemony’ (p. 124). Utilizing the frictions produced by globalization on the one hand, and the different communities (the plantation community, Nepali community, party community) on the other hand, women plantation workers have revised the ‘workable sisterhood’ of Ghumaori. The everyday of their lives are finely etched through the next three chapters, ‘Fair Trade vs. Swachcha Vyapar’ (‘a distinct Nepali iteration of Fair Trade that incorporates awareness of gender hierarchies’, p. 128)), ‘Will My Daughter find an Organic Husband?’ and ‘“Tadpoles in Water” vs “Police of Our Fields”’. The manner in which household conflicts and domestic decisions are entangled with women’s entrepreneurship, the ways in which women tea farmers and plantation workers have designated values to their work and workplaces, the modes in which they have mobilized within the institutions of management and funding give us not only a dense description but also an awareness about the distinctive connections between the public and the private spheres. At the end, she argues that Fair Trade has given the rural women of Darjeeling a new language to articulate agency and like all languages, the excess of meanings learnt through Fair Trade has given them the ability to contest formulaic implementation of Fair Trade. Sen’s study promises at the beginning that her aim is to understand the place-based meaning making that happens at the nodal points of local-global interstices. It seems that to do so, Sen often brings similar but differentiated meanings of certain conceptual or institutional terms together—Fair Trade and Swachcha Vyapar, Women’s Wing and Ghumaori—to explore the global and the local in relation to each other. Her engagement with the dynamic relationship between space and place, however, sporadically touches upon the connecting points between geo-political formations, imagined geographies of belongingness, and materiality of spatial hierarchies. She leaves tantalizing references through details of the differentiated landscapes of huge plantations and small-farms of tea, the ‘home stay’ with stake-holding small-owners/plantation workers, the ‘eco-housing’ for Fair Trade enthusiasts, the meeting spaces of Ghumaori—but does not bring them within a thread of argument on gendered meanings of space and place. This book is definitely a step forward in bringing materiality of space to the study of South Asian feminism and the expectation remains that in Sen’s future research, space will become one of the central analytical categories. Mallarika Sinha Roy is Assistant Professor, Centre for Women’s Studies, School of Social Sciences, Jawaharlal Nehru University, New Delhi. She is the author of Gender and Radical Politics in India: Magic Moments of Naxalbari,1967-1975 (London and NY: Routledge, 2011). Her research interests include social movement studies, gender and political violence, and the history and politics of South Asia.